FILTECH has an established track record in bringing together the technical and commercial sectors to develop global business relationships. FILTECH 2018 will again be the international platform and solution provider for all industries covering every market segment from 13 – 15 March 2018, Cologne, Germany. FILTECH 2018 will feature over 380 Exhibitors at the venue Koelnmesse in Cologne. In 2016 more than 31% of all foreign guests came from overseas – in total 76 nations were represented offering Exhibitors a unique possiblity to generate new business. Companies reported an overwhelming number of new contacts, a marked willingness amongst trade visitors to invest, quite specific contract negotiations and concrete business deals. FILTECH 2018 Conference will feature once again the latest advances and techniques in liquid/solid and gas/particle separation (dust, gas & air filtration). You profit from high-level knowledge transfer and learn about future trends and perspectives! The FILTECH Conference is a Must for all those concerned with designing, researching, purchasing, selling F&S equipment and services and attracts presenters and an audience from all over the world. Technology and know-how transfer is a main target. FILTECH 2018 Conference will feature once again the latest advances and techniques in liquid/solid and gas/particle separation (dust, gas & air filtration). Present your latest findings to an international audience! The FILTECH Conference is a Must for all those concerned with designing, researching, purchasing, selling F&S equipment and services and attracts presenters and an audience from all over the world. 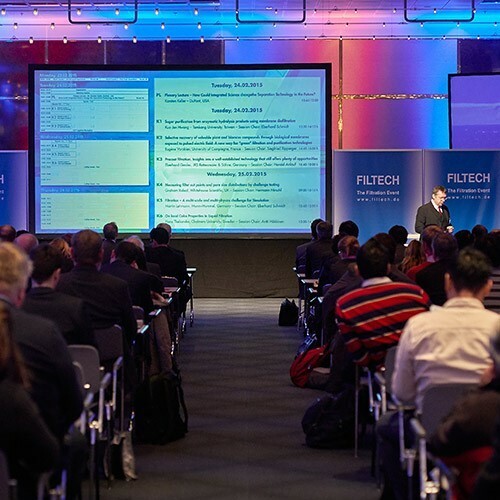 FILTECH 2018 Conference features close to 200 technical papers, a Plenary Lecture and several Keynote Lectures presented by leading experts.